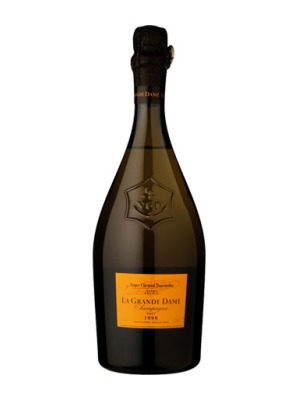 Veuve Clicquot La Grande Dame 2004 is a popular Champagne available from TheDrinkShop in 75cl to buy online. Visit TheDrinkShop for the best price for 75cl of Veuve Clicquot La Grande Dame 2004 or compare prices on our other Champagne products. A pale gold colour with jade glints and incredibly fine bubbles. The nose offers typical Chardonnay characteristics - herbaceous undertones and mineral touches. The Pinot Noir offers scents of candied fruit (citrus fruits, apricots, quince) and almond emerge. The tongue is reminiscent of the nose with clear-cut and perfectly well-adjusted composition with a delightful and luxurious smoothness. Where to buy Veuve Clicquot La Grande Dame 2004 ? Veuve Clicquot La Grande Dame 2004 Supermarkets & Stockists. You can buy Veuve Clicquot La Grande Dame 2004 online in most retailers and find it in the Champagne aisle in supermarkets but we found the best deals online for Veuve Clicquot La Grande Dame 2004 in TheDrinkShop, DrinkSupermarket.com, and others. Compare the current price of Veuve Clicquot La Grande Dame 2004 in 75cl size in the table of offers below. Simply click on the button to order Veuve Clicquot La Grande Dame 2004 online now.